So, I haven’t done an update on my hair regimen in a long time. In fact, I don’t know if I’ve even done a regimen post. I think I have, but I can’t remember, ha! Anyway, let’s get to it. I still use a lot of products, but there are some that have been staples since I learned how to take care of my natural texture. Keep in mind, I live in Chicago (extreme cold/hot/humid.) This regimen is pretty consistent throughout the changes in weather. I can’t live without this stuff. I love it, love it, love it. I don’t think I will try to make my own, ever. I just don’t think it could compare. I do, however, keep track of how much I use by marking the lid with the month and year. I get the jumbo jar which is pricey ($29.99). Target sells a smaller jar ($17.99), but it doesn’t make economic sense–unless you have an emergency. Every time I think I am going to try something less expensive, or make my own, as soon as I get to that last, snotty drop I am racing to the store for another jar. Shame. Leave-in: Jessicurl Deep Conditioning Treatment (formerly Weekly Deep Treatment) I layer this over a lighter leave-in. This stuff is magic. Light Leave-in: DevaCurl One I stopped using this for a few years because they changed the formula. But I’ve started using it again, and I haven’t had any adverse effects. Sealant: Homemade Coconut Oil blend ( This recipe is based on naptural85’s coconut oil moisturizer .) Using a hand mixer, I blend coconut oil, shea butter, castor oil, olive oil, jojoba oil, rosemary essential oil, and jasmine essential oil (you can choose your own essential oils, but use sparingly because of the scalp.) Sometimes I will add grape seed or argan oil to the blend it depends on what I have on hand. Just enough to coat the strands, otherwise you will have an oil slick all over your ears and neck. Shampoo: This has been a complicated one. I am currently using Terressentials lavender or left coast lemon. Now, I have a love-hate relationship with this clay cleanser. I LOVE the results, but my scalp hates the stuff, so I rotate this out ( I use the Terressentials every third or fourth wash) with As I Am cleansing pudding, which I just started using. The cleansing pudding has an ingredient, piroctone olamine, which is known to be a great scalp cleanser, and to promote growth. It is a little drying, so I do a short deep condition( with Tresemme Naturals condish–I put a lot of this in my hair, and then briefly run it under the shower stream to activate, and then I detangle with my fingers, or a shower comb.) After I detangle, I leave it in, place a plastic cap over my head, finish my shower duties, take the cap off, and then rinse it out. I started working with ph a few months ago, and it has done wonders for my hair. This means that I try to use products that range between 4.5-5.5. 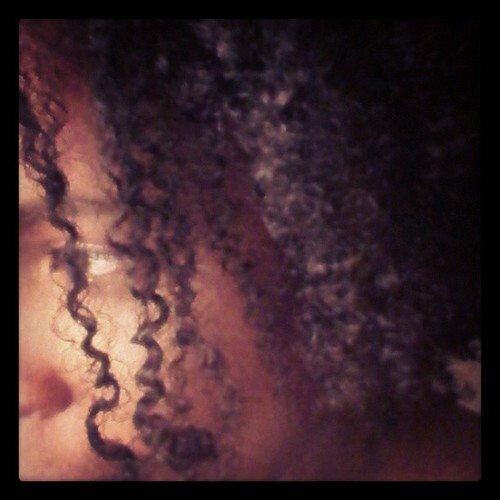 I use the Terressentials with Aubrey Organics White Camellia conditioner. This feels really weird. BUT the Terressentials is really alkaline( maybe 9 or 10 on the ph scale? But it’s a solid, so I am not sure), which means that it opens up the hair shaft, and then fills it with moisture. When I put the AOWC on it feels really squeeky, which means that it is very acidic and that it’s closing the cuticle. I rinse this out, and then put the DevaCurl one in (acidic at 4.7.) I get fabulous hair when I use these two products together. Confusing, right? Well, the last leave-in/conditioner I put on my hair is acidic (between 4.5-5.5). The Natural Haven has a ph list for both conditioners and shampoos. WARNING: Don’t ever try to use the AOWC on it’s own( as a leave-in or co-wash–don’t do it!!) because it will tangle your hair big time. SERIOUSLY. I learned this the hard way. Oyin Handmade: HoneyHemp Conditioner I often use this as a pre-poo because it softens tangles. (Be careful how you store this because hemp oil goes rancid, so I would put it in the ‘frig for storage.) I get the big bottle from the website–it just, yes, makes economic sense. *sigh* That was a long one, but I hope it helps somebody out there. It took me a long time to get to this point. I have gone through so many products to get to my hair’s maximum potential, but it’s been worth it. Yup. Next post: How I keep my hair moisturized in between washes. Annual Hair Post: I’ve Been Doing This All Wrong!